Get back to nature with a visit to this award-winning, all-weather attraction. Discovery Centre, gift shop, cafe and boat trips. 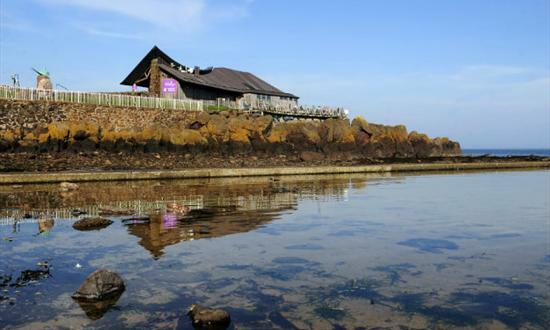 Only 30 minutes from Edinburgh and perched on a rocky outcrop at North Berwick Harbour, overlooking the islands of the Firth of Forth and sandy beaches of East Lothian, the five star Scottish Seabird Centre offers something for all ages, come rain or shine. A world-leader in remote wildlife viewing, in the Discovery Centre visitors can control interactive live cameras to zoom in on the wildlife action on the world-famous Bass Rock, Isle of May National Nature Reserve, plus other islands and harbours. Open year-round, there’s the chance to uncover more in the Wildlife Theatre, Flyway Tunnel, Environment Zone and Telescope Deck. There’s different wildlife throughout the seasons including puffins, gannets, seals and much more. During the holidays there’s a programme of family-friendly events. Unwind in the licenced café which is full of locally-sourced produce and on warmer days sit out on the sun deck overlooking the Firth of Forth. The gift shop also stocks items from local artists and craftspeople, as well as mementoes. There’s also the chance to extend your Seabird experience with one of the various boat trips to the Bass Rock and Isle of May – the Centre has exclusive landing rights for the Bass Rock and also runs photography trips to the Isle of May.